RISE from David Karlak on Vimeo. Fans of American actor Anton Yelchin likely know him best for his recent turn as the original Starfleet crewman Pavel Chekov in the 2009 reboot of the Star Trek franchise from director J.J. Abrams, in addition to extensive work within the realm of genre filmmaking, including the 2011 remake of Fright Night and the 2014 indie zombie rom-com Burying the Ex. Of late, it would appear that the young Hollywood star would appear to be intent at making a name for himself with even more films set within wildly imaginative narrative landscapes, as Yelchin is set to return in Star Trek Beyond later this summer. But beyond seminal television series creator Gene Roddenberry's classic work of contemporary science-fiction drama, Yelchin has now headlined the five-minute short film Rise. The short was released online by director David Karlak (The Collection), based on a project that said filmmaker has been developing under the auspices of Warner Bros. Pictures since 2012. 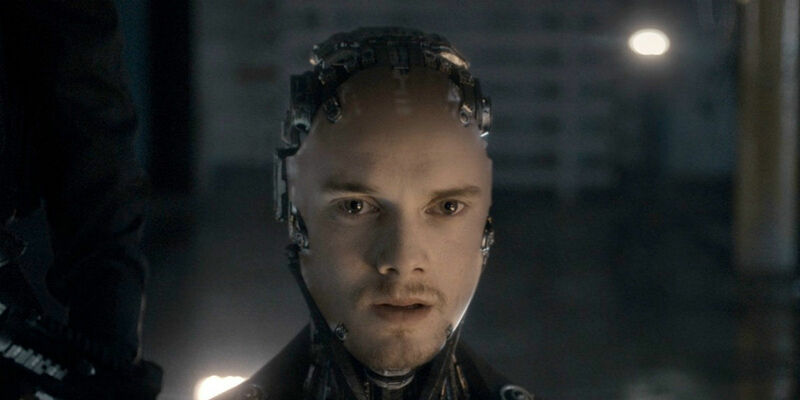 In the short film featured above, Yelchin and co-star Rufus Sewell (Gods of Egypt) star as opponents in a dystopian future wherein sentient robots rise up against the humans that created them after far surpassing organic life in terms of intelligence and civility. Replete with the kind of VFX that is sure to garner the attention of those viewers who have so far been amused by the production values represented by such contemporary sci-fi blockbusters as Star Trek Into Darkness and Star Wars: The Force Awakens, Rise promises the directorial effort from Karlak that could very well make for one of the more novel and intriguing original genre productions in recent memory. "In the near future, sentient robots are targeted for elimination after they develop emotional symmetry to humans and a revolutionary war for their survival begins." Based on said description alone, and coupled with the footage from Karlak's preliminary attempt at bringing his ambitious proof-of-concept project to life, there are certainly comparisons to be made to past artificial intelligence centered narrative films, both good and bad, such as Ridley Scott's celebrated cult-classic Blade Runner as well as Neill Blomkamp's critically panned Chappie of last year. With any luck, Karlak's venture will be more successful with audiences than Blomkamp's ill-fated attempt at the same thematic territory, and viewer's can expect a feature length version of the narrative intimated in the above five-minute sequence in due time. Given both Yelchin's aforementioned experience in the science-fiction genre coupled to Sewell's tenure working with contemporary genre filmmaker Alex Proyas (Gods of Egypt), there is certainly some promise in what has been presented thus far from Rise. However the production continues to take shape moving forward, it's obvious that Karlak has a clear visual conception of what his finished will look like - though it's now entirely up to Warner Bros. to decided whether or not to move forward with a feature length theatrical release. Screen Rant will keep you updated on all information related to Rise.